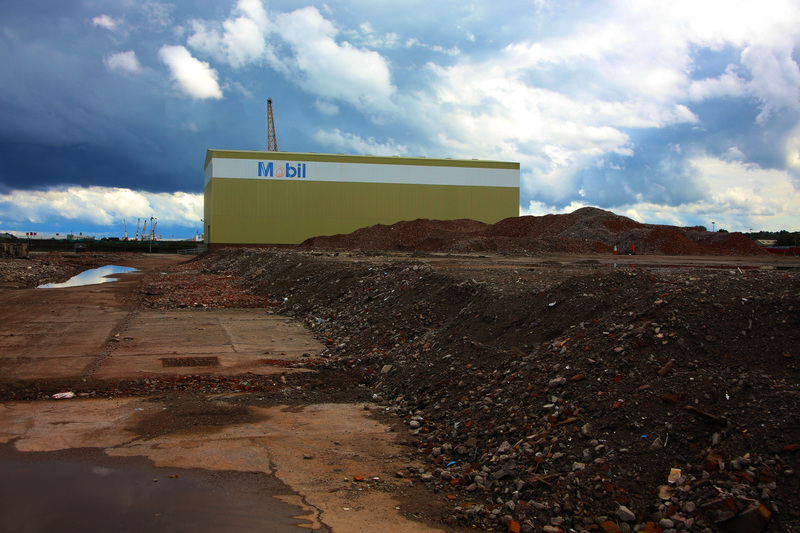 Residents of Wirral are starting to see activity on the Wirral Waters site on the Birkenhead docks system. In August there were announcements on two future developments. A large office block development has been granted planning permission on Tower Wharf near Egerton House and Wirral Metropolitan College had been given planning approval for a new campus nearby close to their existing Twelve Quays campus. Both schemes should be complete by October 2016. There’s also been a lot of activity on the old Mobil site off Wallasey Bridge Road and Beaufort Road on the West Float. The Mobil Oil plant opened in the 1930s as an oil terminal and blending plant but was closed in 2001and lay empty for years. Earlier in the year some of the Mobil buildings were demolished. A clearance and land reclamation scheme has been underway over the summer. 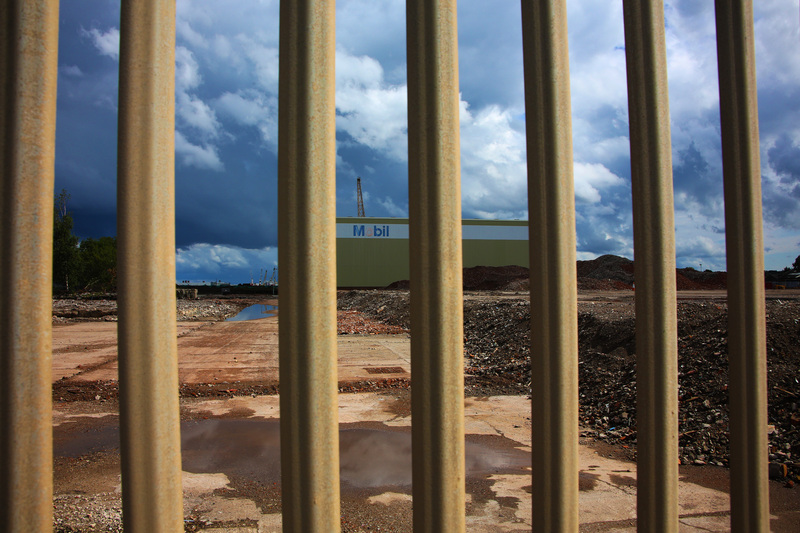 I managed to get a few photographs from the main road of the site. 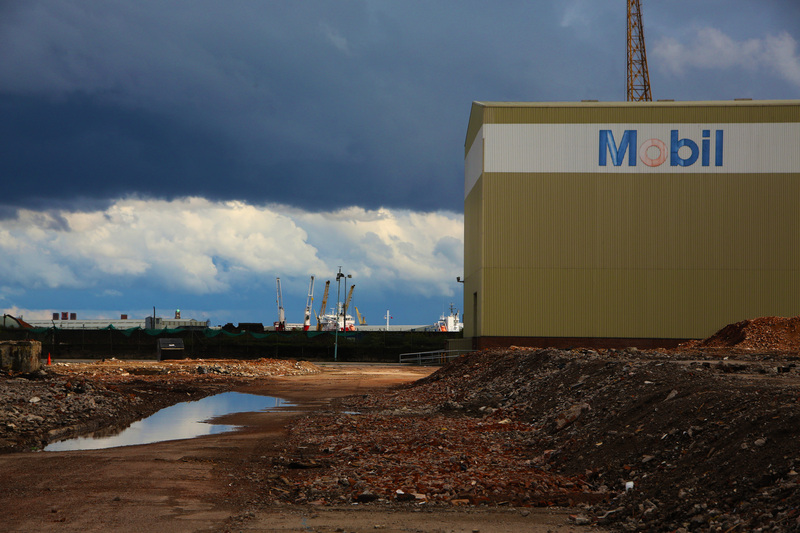 The Peel Group is planning to develop a manufacturing park for motor and rail industry suppliers on the 35-acre former Mobil oil storage site as part of the £5bn regeneration of Birkenhead Docks. The site is next to the planned International Trade Centre where a £3.8m land remediation project has already been completed. Peel hopes to attract suppliers of Jaguar Land Rover and General Motors, which produce cars at Halewood and Ellesmere Port, as well as Bentley in Crewe and Toyota on Deeside. 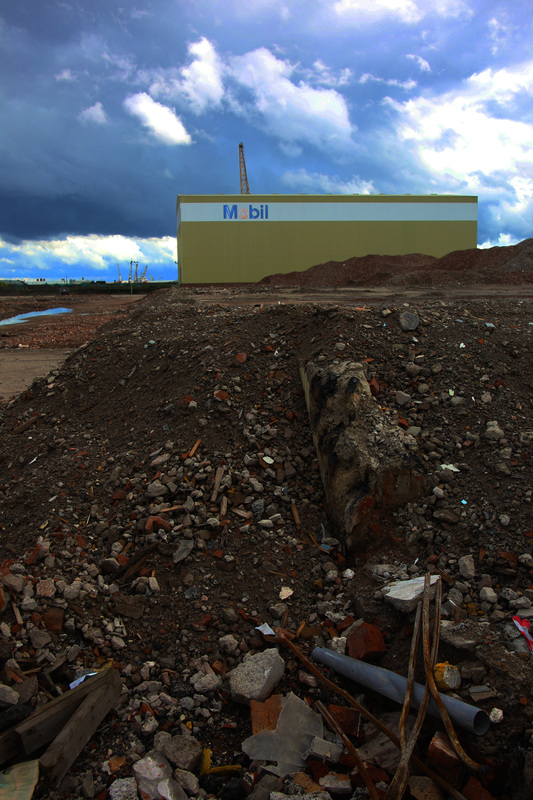 This entry was posted in Birkenhead, Docks, River Mersey, Urban deprivation and tagged Birkenhead Docks, Wirral Mobil Oil plant, Wirral Waters by briansimpsons. Bookmark the permalink. 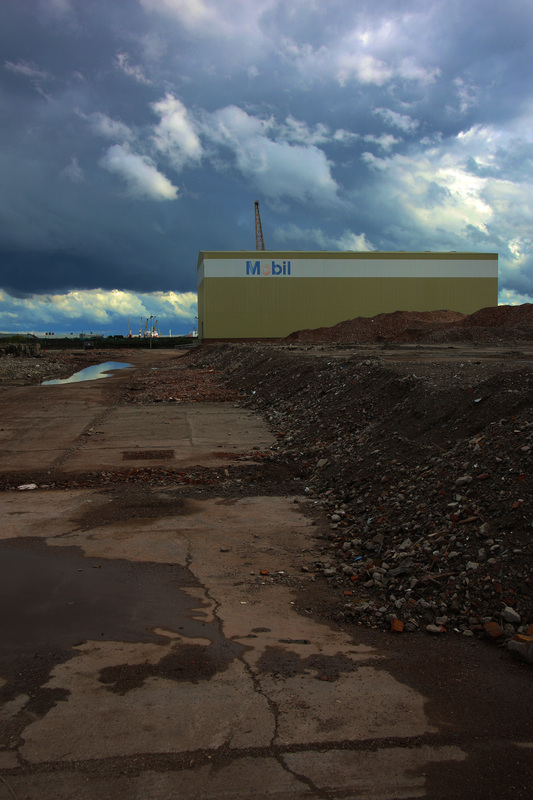 Really interested in all your photos of Birkenhead Docks. 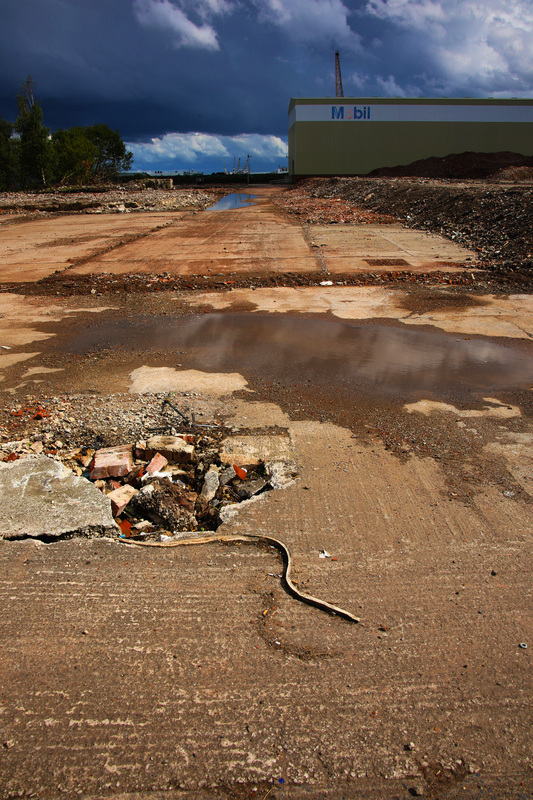 We are creating a mural with a project called …and the River flows on to be installed in Wirral Waters. Would love to get in touch with Alan Maddocks in Perth who posted on your blog. Also looking for photos of people who worked on Birkenhead Docks for the next panel of our mural which is about the dock workers. Find us on tumblr – and the River flows on or follow us on twitter @birk_summerart. Would be good to hear from you. Many thanks for your comments. I have passed your details on to Alan Maddocks in Australia. I have emailed you directly regarding my photos.